Motorcycle accidents are very dangerous as motor cyclists lack the protection of seatbelts. Motor cycles are balanced on two wheels and unlike car drivers, they do not have seat belts or the outer body of the vehicle to protect them from the worst of impacts. Too many motorcycle accidents result in serious injuries and deaths. All road accidents including motorcycle accidents are caused by negligence. Most of them are caused by cars and other motor vehicles. The careless driver almost always argues that he “never noticed the motorcycle”. If you or a loved one has been injured in a Minnesota motorcycle accident, call me at 612- 236-1320. 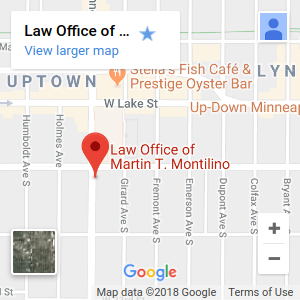 I am Martin T Montilino and I have been representing victims of vehicle accidents for the last 16 years. I have personally been involved in each and every case I have represented and have ensured that the victim received full compensation for his injuries and that the rights of the injured person were not violated. If you or a loved one has been injured in a motorcycle accident, your health and treatment comes first. Your rights follow a close second. I have more than 16 years of experience in representing victims of motor cycle accidents. I have fought for the victims and I assure you that I will fight for your rights and compensation till the very end. Left Turns – This is the most commonly occurring motorcar and motorcycle collision. At an intersection the motor vehicle makes a left turn in front of the motorcycle leading to a collision. Car’s Blind Spot – The driver of the car cannot see the motorcycle that is riding alongside the car’s lane. When the unsuspecting driver tries to change lanes collisions happen. Large Vehicles – The motorcycle is obscured from the driver’s view due to a large vehicle like a van or a semi truck. In such cases the motorcycle actually seems to materialize from no-where. Hazardous Road Conditions – To a four wheeled vehicle, potholes, rail road tracks or even a fallen tree is a minor irritant. This is not so for a motorcycle which may have to slow down, change lanes or take a detour. Collision can happen due to bad road conditions. Weather Conditions – Snow, rain etc affect the brakes of the motor cycle as well as cause balancing problems. Even more risky is the fact that the road becomes slippery and causes the motor cycle to skid and cause accidents. Strong Winds – Strong and gusty winds or even wind gusts caused by passing of large trucks can cause a motor cycle to lose balance if the driver is unprepared. Often insurance companies tend to argue with the victim and try to get away with paying lower compensation because the driver of the car or other motor vehicle argues that the motor cycle appeared out of nowhere. I leave no stone unturned to ensure that my client is given excellent representation. I investigate the cause of the accident, talk to the investigating officers, study the police reports and even talk to the eye witnesses so that I can fight the case and win my client the best possible compensation which he not only needs but deserves. CALL ME NOW!